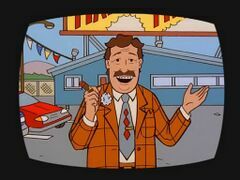 'Happy' Herb is a car salesman in Lawndale. Herb makes his only canon appearance in The Lawndale File, where he commissions Trent for a gig to be used in a TV commercial, paying him "20 bucks, an hour of studio time and a set of tires" (NEW tires, as Trent pointedly tells Jane). Happy Herb is rarely displayed in fanfiction. He makes a small appearance in Daria's Season of Good Will, by Nemo Blank. This page was last edited on 25 April 2018, at 16:53.